I’m running a bit behind in my blogging due to general business. 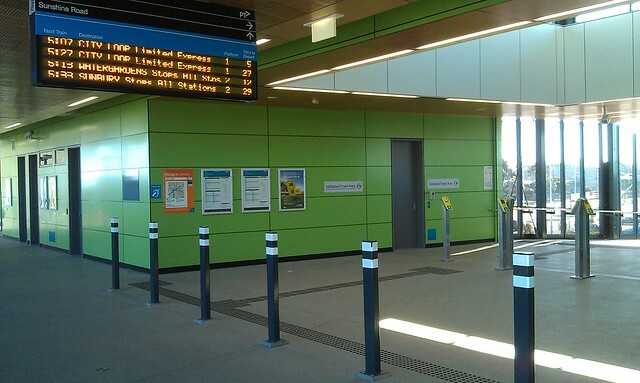 Here are some pictures from the brand new shiny West Footscray station a few weeks ago. There are bike cages as well as car parking, as well as a bike path/ramp from the concourse to the streets on either side. The main concourse/bridge over the tracks is pretty imposing, very visible from the surrounding areas. Chris Hale from Melbourne Uni presented at the PTUA Annual General Meeting recently. 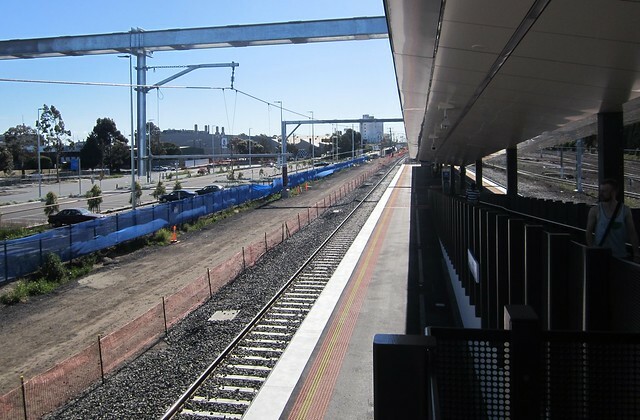 He remarked that Roxburgh Park station looks like a jail. Although I wouldn’t say it’s beautiful, happily the same can’t be said for West Footscray. At the very least, it’s more colourful, with blocks of green, and areas of wood on the ceiling (apparently to help the acoustics and reduce noise). All in all, not half bad for what will become a busy station as urban renewal takes hold in the area. It’s not staffed, apart from PSOs. I would hope and assume that space was set aside for future staff facilities and toilets should they ever be needed — it appears so from the amount of closed-off space on the bridge. One local I know seems to like it. 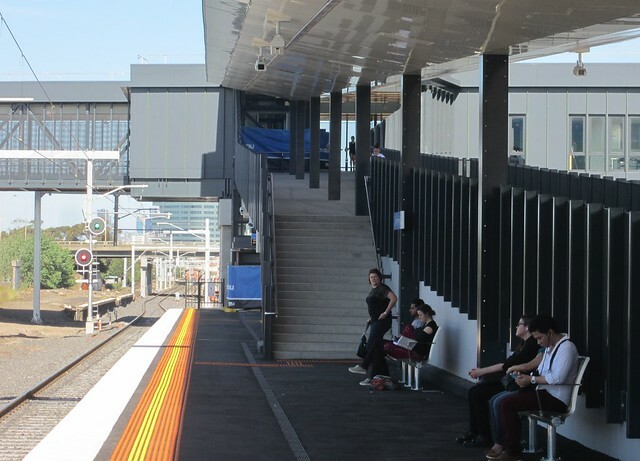 As an occasional user of the old West Footscray station, I’d say it’s an improvement. Hopefully future stations will continue to look less like jails and more like a welcoming spot to catch a train. 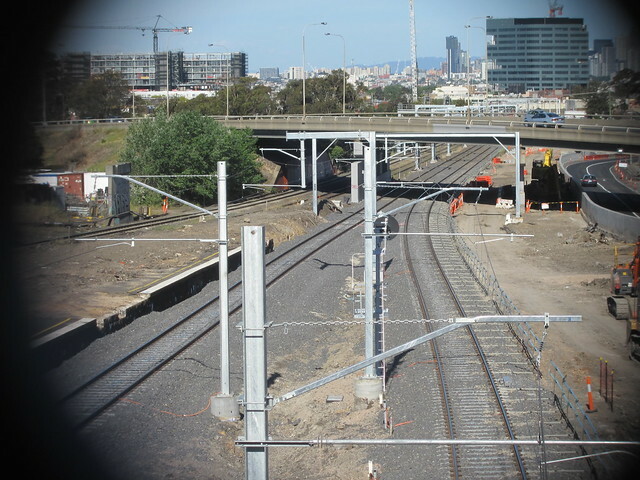 Update 6/12/2013: I’m told one other feature of the new West Footscray is that it has solar PV panels on the roof; enough for all the station’s power needs. Really nice photos; you’ve captured the new design and layout well. I presume that the regional rail trains will come thundering through that station and not stop, is that right? It’s certainly an improvement over the old station (except that it’s now further from my house); although I can’t help thinking that all the new stations are a little overbuilt. And while I’m happy that they’ve installed PIDs and a clock, it’s a little depressing that it is actually something someone might comment on. They should have been at all stations for at least 20 years. I agree, but it is only about 200m further at most. Considering before the move Middle Footscray was only 600m away but Tottenham a full 1.9km away, it is an acceptable move. I especially agree about the PIDs. While Kennet should not have got rid of the station staff, when he did he should have put in PIDs at all the unmanned stations (as opposed to only the premium stations) as well as those automated lavatories. The bridge is rather a lot better looking than the Footscray Station bridge. Nice, looks a lot like Westall. My view is, all railway stations I feel, should have both a toilet and PIDS there too. The irony with my Narre Warren. Despite being a Premium station, and a very busy one at that, we are yet to have a PIDS. How much I would love us to get them. Yet at least Narre Warren has toilets. Many of the railway stations are getting a little bit over engineerd, and yet they lack two very important features. My complements for the nice photos. I haven’t ventured to this station, but it appears the platform roof if set back quite a way from the platform. With the way the roof slopes to the middle, rather than edge of the platform, I wonder if they’ll offer less protection from the rain? 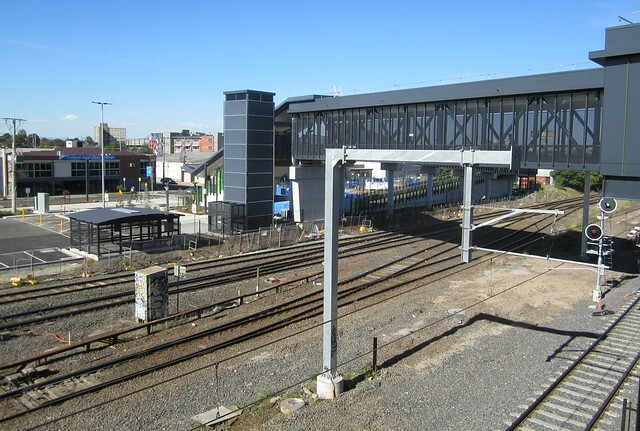 Compare these to the old-style stations, say, Camberwell/Glenferrie/Auburn, where not only does the roof slope down but there is a metal girding that drops down at the edge to give added protection from the wind-swept rain. I’d rather have a toilet than a clock. 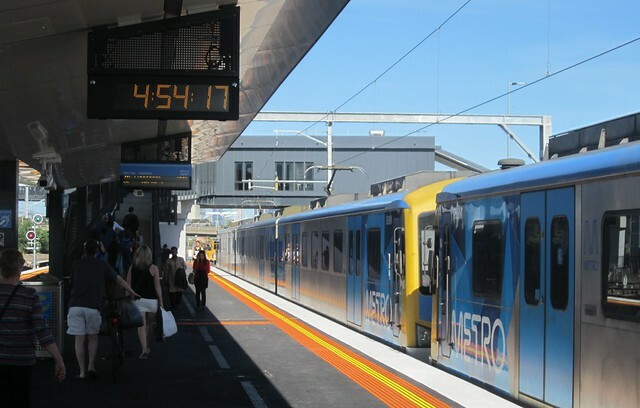 PIDs: are we ever going to get them at older stations? It is so frustrating having to continually poll the green button to find out if the next train has been delayed or cancelled, especially on low frequency lines like Upfield. I agree. My bugbear is that these stations are obviously designed by people who don’t take trains. Given that there are only electric trains, surely the cover could extend at least to the carriage edge. Also there is the problem of the high roof which gives little shade or protection. 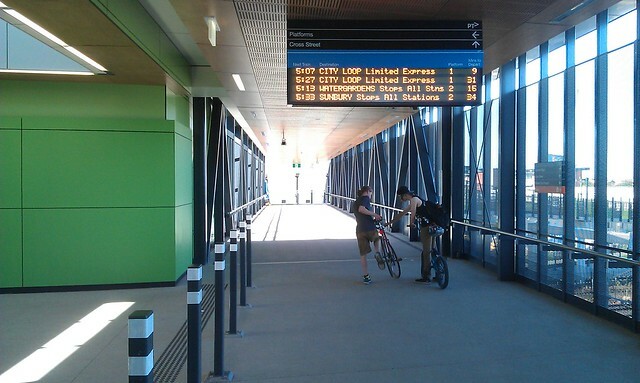 All new stations should be built with LCD displays (the same as at Southern Cross). LCD displays show more information, they are modern and they can easily change the type of information that can be displayed at anyone time. Current displays in the suburbs are terrible and reading time is increased as they’re higher and the information drags across showing bit by bit, rather than showing all the information at once, such as those at Southern Cross Station.